HomeLecture & Lab 3-25-17 AREDN Testing and Configuration @ FOFM in Dallas! Lecture & Lab 3-25-17 AREDN Testing and Configuration @ FOFM in Dallas! Our next Lecture and Lab will be all about AREDN, the Amateur Radio Emergency Data Network. An Amateur Radio Emergency Data Network (AREDN™) is a high speed data network built with Amateur Radio Operators and Emergency Communications Infrastructure in mind. AREDN™ is self-configuring and self-healing. 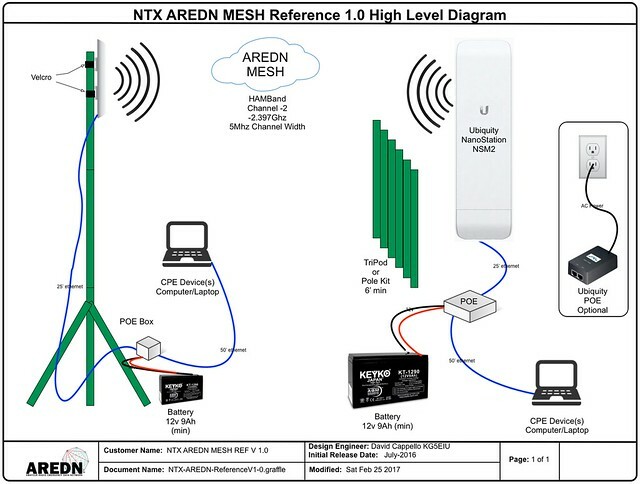 Where possible, AREDN™ will establish connections with as many other AREDN™ compatible devices (nodes) as possible and form a redundant mesh like network. Bring your NSM2 and/or Rocket/Bullet radios to test operation, update to the latest firmware, and get up-to-the-minute tips and tricks concerning proper setup, and participate in a full mesh exercise. If you don’t have the radios, that’s okay! Observe, ask questions, and find out if AREDN is a good idea in your ham shack! ORDER NOW – In time for the L&L! Bring your laptop with an RJ-45 patch cables and connection to the lab. If you have some VOIP gear bring that along will be experimenting with VOIP configurations and setup. Here are descriptions of components you may wish purchase before the lab. It is not required, but if you would like an operational AREDN unit, you may want to bring one of these units. Dallas Amateur Radio Club will be there for the annual “Wings of Freedom Tour”. If you love vintage aircraft, this is your weekend to enjoy World War II Bombers and fighter aircraft.